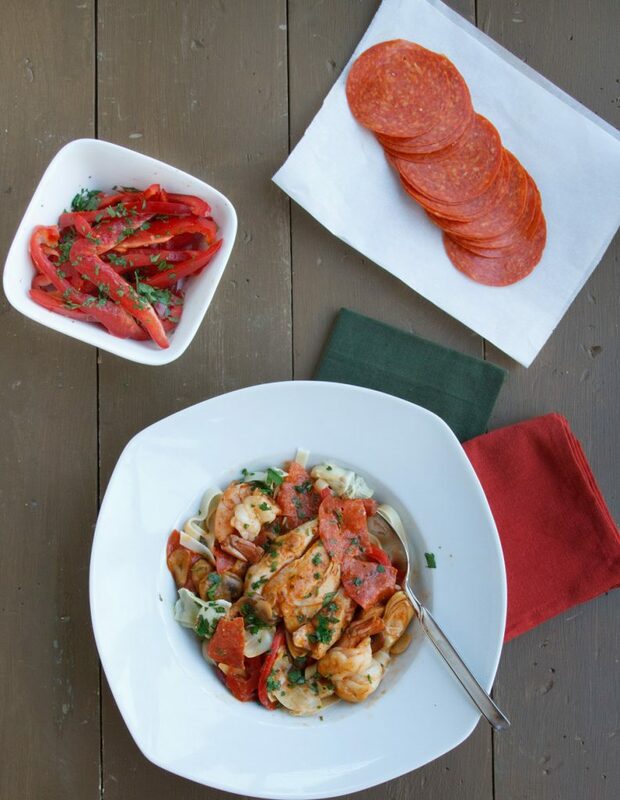 The combination of flavors makes this Chicken and Shrimp Pepperoni and dish you'll remember! 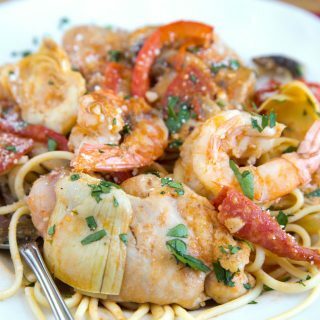 This spicy sauce with artichokes and mushrooms served over linguine will be a hit with your family and friends! During my restaurant days, one of my favorite dishes to make was Chicken Pepperoni. Not only was it a delicious dish, but it reminded me of the time I spent with Mama Jeanette, and how she taught me so much about food and about myself. 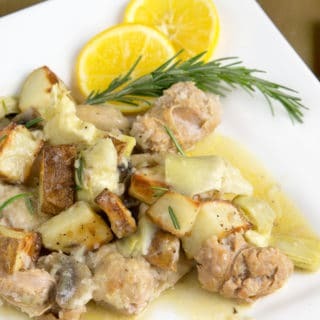 Chicken was always a favorite in my restaurant, so I did my best to make the dishes special, flavorful and filling. They needed to have sauces that made you want to get every last bit with a piece of crusty bread, and I didn’t want you leaving my table hungry! Mama Jeanette would tell me “Sonny Boy, you fill their stomach, and you fill their heart but most importantly you fill their soul. That’s how you measure success, Sonny Boy”. And Mama Jeanette was always right. So for my customers that would do me the honor of spending their hard earned money on my food, I gave my all. I would do my best to offer less expensive options that would still make their nights memorable and fill their souls. This is one of those dishes. 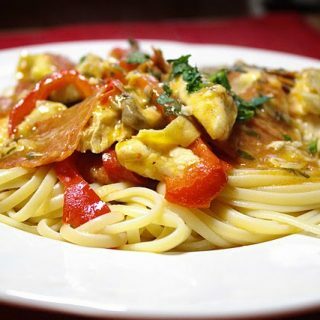 When you make this for your family and friends have more grated Romano cheese available and some good crusty bread. Add a nice tossed salad and glass of wine and you’ll be in heaven! Just remember to think of me and drink a toast to Mama Jeanette! And if you’re looking for another delicious date night dinner make sure to check out my Chicken Marsala recipe. Dredge chicken thighs in seasoned flour and add to hot oil. Let chicken cook for 2 minutes until done on one side and has a little color, then turn over and add sliced peppers, and mushrooms. Add the shrimp and continue to cook until, shrimp are almost fully cooked. Add the white wine to deglaze the pan and stop the cooking. Now add the chicken stock, marinara, artichoke hearts(along with some of the juice), Romano cheese and red pepper flakes. mix well. 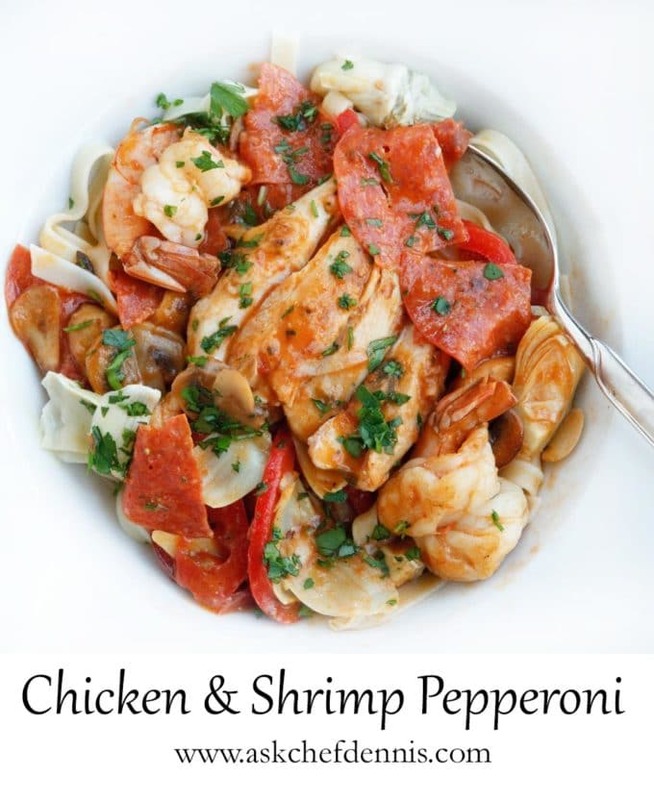 Remove the shrimp from the pan and add ther pepperoni slices, and allow ingredients to reduce slightly 3 -5 minutes. 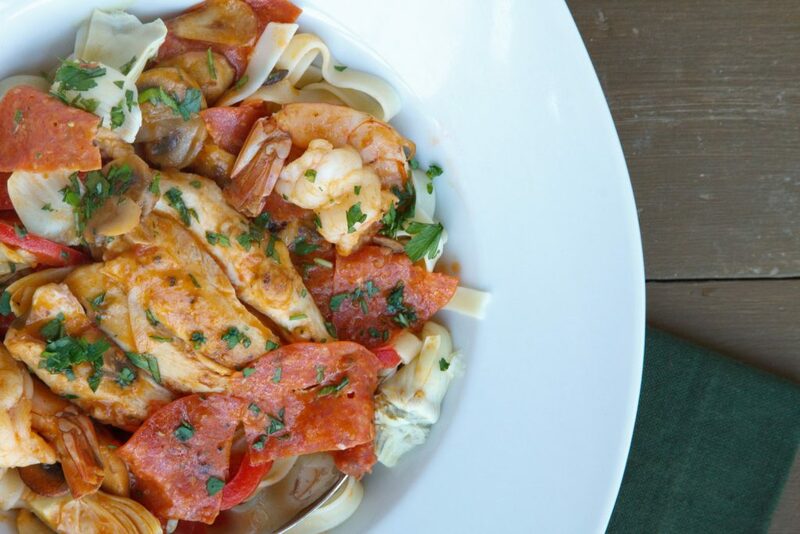 Serve the chicken and shrimp pepperoni on a bed of linguine. 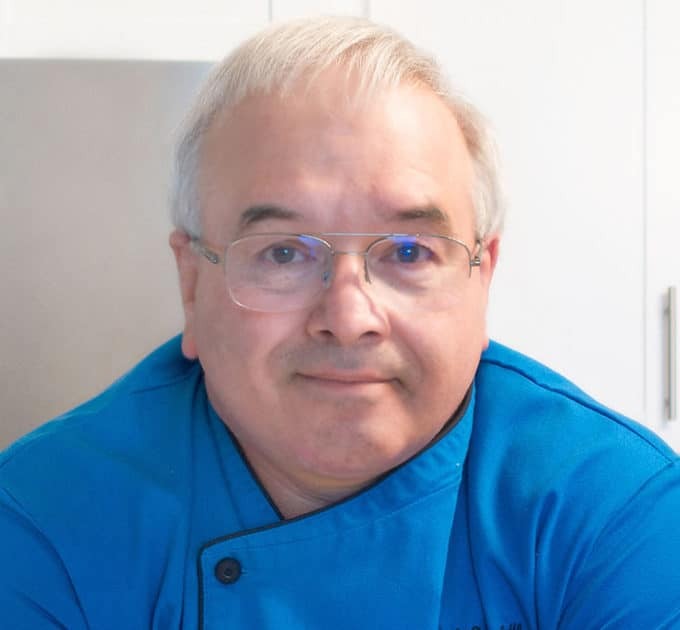 Chef Dennis! My paisan! My wife told me this was one of the best meals I’ve ever cooked. I’m trying one of your beef dishes next. Any recommendations? thanks Joe, happy to hear you enjoyed the chicken and shrimp pepperoni! As for beef I don’t do too much with it since I stopped eating beef a long time ago, but my wife still enjoys beef so I do make a beef braciole thats a little different but has some nice flavors. Just made this over the weekend for my husband. I omitted the mushrooms and artichokes as he is not a fan, but the result was still amazing! so glad to hear you made my dish and that he enjoyed it! It really is a tasty dish! I look forward to hearing how your other family members like it! That looks so gorgeous! 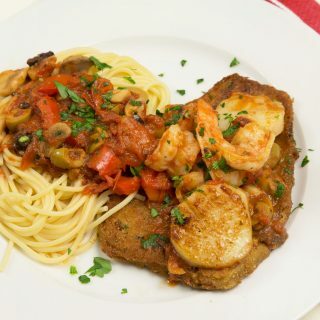 I will definitely be trying this dish this weekend! what a delicious combination…i never would have put those three meats together! yum! Oh my!! What a lovely dish!!! This looks absolutely amazing! I would never have though to combine chicken & pepperoni! I will definitely have to give this one a try! Yum! This chicken-shrimp-pepperoni just made me super hungry! Thanks for sharing on this Monday, Chef Dennis! I’ll be Mama Jeanette was Italian?! It’s amazing how as she says good food does fill the soul. Nothing like a great meal with wine, especially this time of year when we’re having just about our first fall rain where I live. 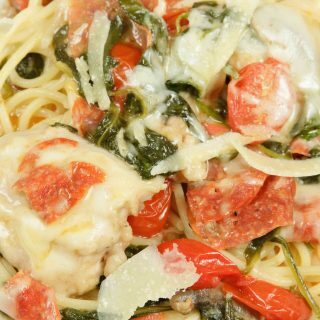 The combo of chicken, shrimp, salami and cheese together have that umami element built in- yum! Mama Jeanette was half Italian on her Mother’s side and French Cajun on her Fathers side, quite an interesting combination. She was a very special person. I’ll toast to that! Your Mama Jeanette was a wise woman. 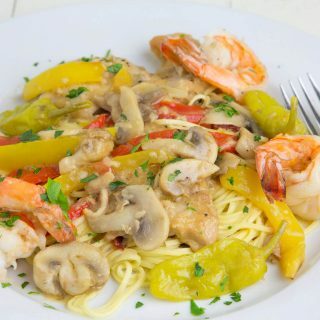 Since I really enjoyed the chicken only version I know I’d love it with the addition of shrimp. it was pretty darn tasty Larry! It is delicious Lea Ann, I hope you get to try it! Thanks Cher, let me know if you do get a chance to make it. Looks fantastic, Dennis! Thanks for sharing! I love hearing about Mama Jeanette – I couldn’t agree more – food feeds the soul. I know that’s how I show my love for my family and friends. I think the best part about being able to cook is the effect your food has on other people. Oh yes… with more more more cheese…. yum! Love this a lot!